These are the walls of the El Badi Palace Arabic: قصر البديع‎ - meaning the incomparable palace) in Marrakech, seen sadly from the outside only, as it was closed on the day we were there. 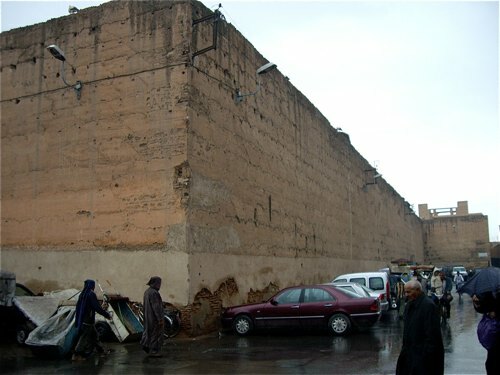 Marrakech has, as one of the royal cities of Morocco, several palaces. The El Badi Palace was built by the Saadian king Ahmad al-Mansur (1549 - 1603), and was finished in 1578. It took more than 25 years to construct and contained around 360 rooms located around a large courtyard. Its design is greatly influenced by the palace in Alhambra in Spain. The El Badi Palace was an architectural marvel. It had a large pool decorated with Italian marbles and gold imported from Sudan. It is now in ruins as the succeeding Alaouite rulers disliked this monument left by their predecessor. The El Badi Palace was torn down by Sultan Mawlay Ismail reused to decorate his own palace in Meknes. It rained the day we walked the Kasbah area, and we were informed by an eager young man that the entrance was at the other end of the complex. He took us on an unauthorized trip into the maze of streets of the Mellah area, once the home of the city's Jewish population, but that is another completely different story.